One of the most common questions I get from clients is, “Is it ok to mix finishes?” Not only is it okay, it’s a must. Mixing and layering different tones and finishes is what gives a space interest and dimension. 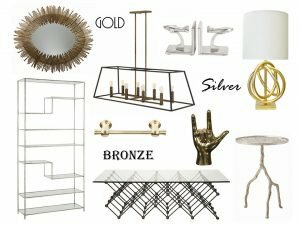 Mixing metals, for example, doesn’t have to be over-the-top bold and in your face, subtly folding in a few pieces here and there will not overpower the space and will make it interesting. On a smaller scale, starting with a few bookcase or countertop décor items, for example, is a great way to begin introducing multiple finishes throughout a room. The key is to not overthink it and sporadically add in items you love. Ever stare at a big blank wall and think, “What in the world am I supposed to put there?” As a designer, I have encountered numerous homes with large walls that clients struggle with knowing how to fill them. I suggest a gallery wall. I’m talking large scale, acquired art pieces. When putting together a gallery wall for a client, I hone in on subject matter that is personal to them. Once settled on all the art pieces, a scaled drawing is done to ensure proper layout and fit to the exact dimensions of the wall in question. No longer does the client have to stare at a blank wall, instead it is lined with interesting personal pieces that make a statement about who they are. The only question left is: What will you fill your big blank canvas with? Give Ardent Design a call today at 317-850-6145 or visit them online at ardentinterior.com.